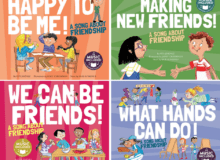 PreS-K–Guided reading questions and texts set to music explore the various elements of friendship and being a good friend. Topics such as making new friends, being a respectful partner, celebrating individuality, and recognizing and accepting differences among peers are the main themes explored. Cartoonish and often exuberant illustrations effectively clarify the text and offer visual clues for primary aged readers. Children with different abilities are shown in the school-set artwork. The catchiness of the rhymes will make this most effective with young students in a classroom setting. VERDICT Consider for medium to large school libraries. ea vol: Jiménez, Vita. illus. by Janet Cheeseman. 24p. (Me, My Friends, My Community: Friendship). further reading. glossary. w/CD. Cantata Learning. Sept. 2017. lib. ed. $33.99.